1. Sekkisei Lotion: Use on thoroughly washed, clean face. Pour lotion generously onto a cotton pad and pat gently on face. 2. Sekkisei Emulsion: Use after lotion. Dispense one or two pumps onto cotton pad and gently spread over skin. A refreshing lotion that enhances skin translucency. Trusted and adored by legions of fans since 1985. Improves skin’s texture, reduces pigmentation, and freckles and refines pore troubles. Penetrates deeply into skin and enhances skin's metabolism to prevent dullness. Instantly brightens skin tone, creating an even glow. Texture: The watery texture gives a cooling and refreshing sensation. 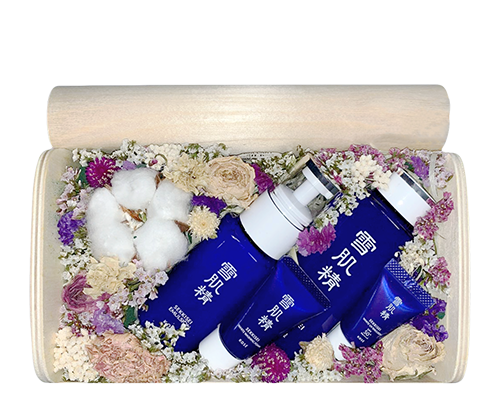 A whitening emulsion that maintains the skin's ability to retain moisture. Formulated with Moisture Balance Polymers to maintain the skin's moisture-retaining balance against ambient air. Inhibits melanin production and prevents freckles, darks spots and dry rough skin caused by UV rays. Gives long-lasting hydration for the skin. Texture: Highly emollient formula that works deep into skin without any stick after-feel.